un océan de PLASTIQUE - L'océan fabrique l'air que nous respirons ! The ocean and photosynthesis of its plant organisms (phytoplankton in particular) absorb CO2 and produce oxygen (O2). The ocean thus absorbs 30% of the planet’s CO2 and produces between 50% and 75% of the oxygen we breathe, depending on sources and geographical areas (16). Ocean warming and acidification are endangering the survival of phytoplankton, seagrasses, mangroves and salt marshes, which are real CO2 traps. In fact, 20% of the world’s mangroves disappeared between 1980 and 2005 (5). The ocean is become increasingly acidic and deoxygenated areas are also appearing. These are lethal to marine life and the balance of nature. The acidity of the ocean remained the same for a hundred million years, with a pH of 8.18. On account of absorbing the CO2 we produce, it is now at 8.08 and the trend is accelerating. In concrete terms, this means that the ocean is already 30% more acidic and will be 50% more acidic by 2100 (27). This has direct consequences for marine animals. Ocean acidification makes life more difficult for small marine organisms that trap CO2 when building their shells. Ocean acidification is bleaching and killing coral. Coral is home to 25% of fish species and provides a living for more than 1 billion people. Ocean acidification is corrosive to the shells of the small sea snails that are the very first link in the food chain. Dead zones (called hypoxic zones), areas with a shortage of oxygen, are increasing in the ocean. Global warming – which limits exchanges between the different layers of water – the rising temperature of the water – which consequently contains less oxygen – and the increasing presence of fertilisers and plant food (29) are indeed creating deadly zones for marine animals. Today, an area of over 245,000 km² is affected, spread across 400 dead zones (28). What is the effect on the ocean? Fish that survive have a lower weight than normal and their reproductive system seems to be affected in the long term. Slower-moving marine animals (for example lobsters or crabs), crustaceans and molluscs are doomed in areas with low oxygen levels. The decomposition of their dead bodies then exacerbates the phenomenon. 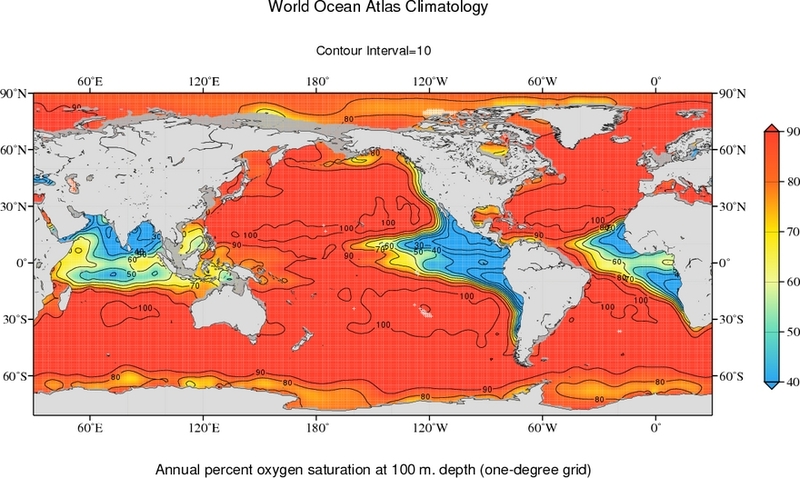 The blue and yellow areas of the map above clearly show worrying levels of oxygen saturation in some parts of the oceans, to a depth of up to 100 metres (30). These anoxic episodes (during which there is not enough oxygen) can last a few hours or a few months. The ocean has a critical role in managing terrestrial CO2 and producing the planet’s oxygen. Ocean acidification and deoxygenation are a danger to marine life, but also threaten the water regulation capacity on which the planet depends to produce 50% to 70% of the oxygen it needs. Less oxygen, less marine life, more CO2 … Global warming and human activity are putting a huge strain on the balance of nature that has existed for thousands of years.